High Quality Content by WIKIPEDIA articles! 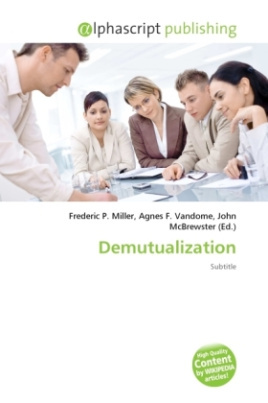 Demutualization is the process by which a customer- owned mutual organization (mutual) or co-operative changes legal form to a joint stock company. It is sometimes called stocking or privatization. As part of the demutualization process, members of a mutual usually receive a "windfall" payout, in the form of shares in the successor company, a cash payment, or a mixture of both. Mutualization or mutualisation is the opposite process, wherein a shareholder-owned company is converted into a mutual organization, typically through takeover by an existing mutual organization.